©1992 Paramount Pictures. All rights reserved. Answering a distress call from a strange planet, the Enterprise finds a crashed Borg ship with one young Borg survivor (Jonathan Del Arco). 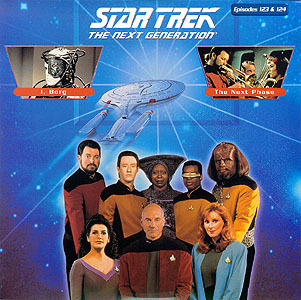 Despite the risk, Captain Picard (Patrick Stewart) beams up the injured Borg, and Dr. Crusher (Gates McFadden) must remove some of his brain implants in order to save him. Seeing a rare opportunity, Picard orders Geordi (LeVar Burton) to sabotage the reimplanted chips by installing an invasive command that will "infest" the entire Borg Collective. Disconnected from the Collective, the captive Borg begins to develop individual identity and emotions. As a result, he befriends several crew members, including Guinan (Whoopi Goldberg). But Picard hasn't forgotten his own painful assimilation by the Borg and is reluctant to pull back from his plan to annihilate them. 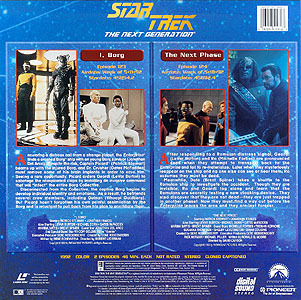 After responding to a Romulan distress signal, Geordi (LeVar Burton) and Ro (Michelle Forbes) are pronounced dead when they attempt to transport back to the Enterprise and fail to re-materialize. Later, when they mysteriously reappear on the ship and no one else can see them, Ro assumes they must be dead. Meanwhile, Data takes a shuttle to the Romulan ship to investigate the accident. Though they are invisible, Ro and Geordi tag along and learn the Romulans are secretly testing a new cloaking device. They also discover that they aren't dead - just trapped in another phase! Now they must find a way out before the Enterprise leaves the area and they are lost forever.